UPDATE: The Sail Loft cleared inspection Aug. 11 and was allowed to re-open. A small fire this morning at the Sail Loft, 80 Atlantic Ave. left the restaurant filled with smoke and water. ISD ordered the restaurant to remain shut until it can clean up all the smoke-laden surfaces, remove the water and fix a wall in the kitchen that was damaged by the fire. The restaurant will also need to pass building and electrical inspections. 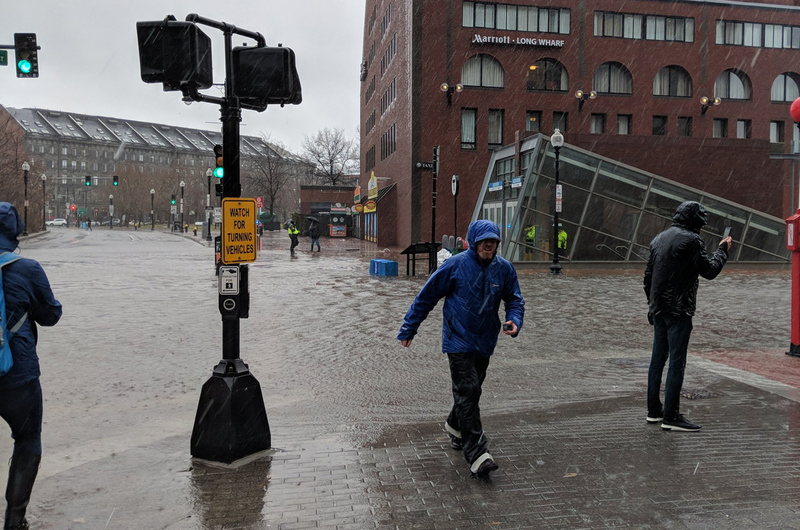 Finn shows us the rising floodwaters on Atlantic Avenue at Long Wharf., around 11:30 a.m. Read more. 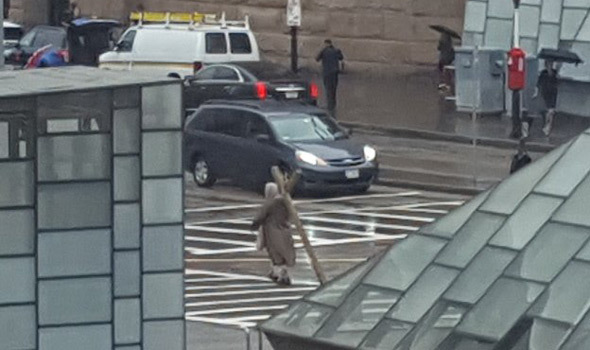 Pernell Banks came across a car flipped on its side at the ramp down into the northbound tunnel near Rowes Wharf shortly before 3 p.m.
Liz Devlin watched a man drag a life-sized crucifix past South Station this afternoon. Read more. NorthEndWaterfront.com has details on a proposal for the old Lavanderia site at 25 Atlantic Ave.
Boston Police report a security guard at the Boston Harbor Hotel, a Homeland Security agent and a passerby teamed up yesterday evening to detain a man they say was trying to flee his wrecked car after he'd smashed several cars near the hotel, injuring at least one person. Read more. 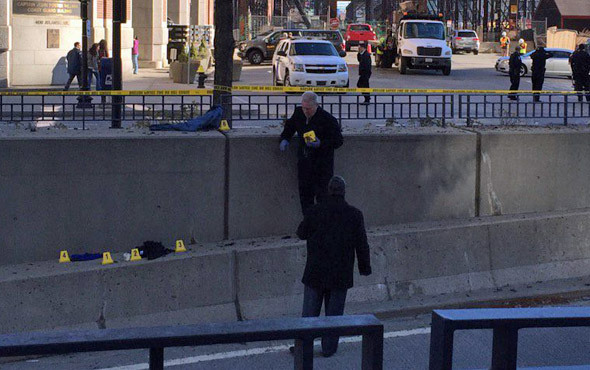 Boston Police report the arrest of James Derepentigny, 50, of Lawrence on a charge of planting a hoax device for this morning's bomb scare that shut Atlantic Avenue, Seaport Boulevard and an I-93 entrance ramp. Read more. Police investigate remains of exploded suitcase. Photo by Jonathan Berk. Police are looking for a man they say left a large suitcase near a Homeland Security vehicle at the Coast Guard building on Atlantic Avenue around 9:50 a.m., then walked away in a hurry. 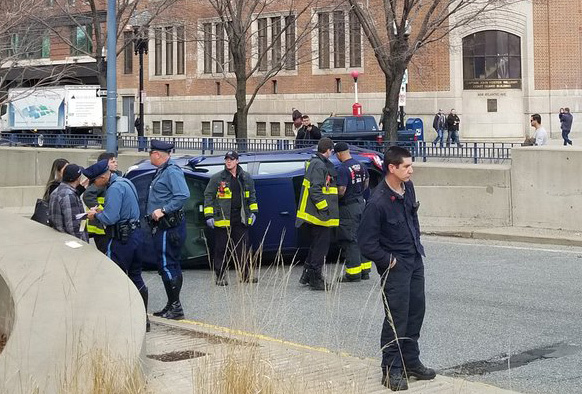 Police responding to the scene quickly shut Atlantic Avenue and Seaport Boulevard over the Evelyn Moakley Bridge as the bomb squad arrived. Eventually, an I-93 ramp was shut as well. Read more. 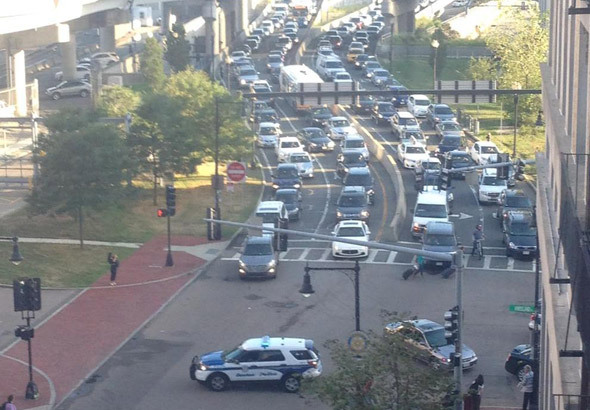 When will Boston PD enforce the do not block the box law? It is constant around the south station roads making very difficult for first responders to get through. Ed. note: Washington and South streets in front of Forest Hills in the morning is similar. Mike McD. shows us what happens when roads around South Station are shut at rush hour to give firefighters easier access to a track fire near South Station, in particular, Kneeland Street and Atlantic Avenue. 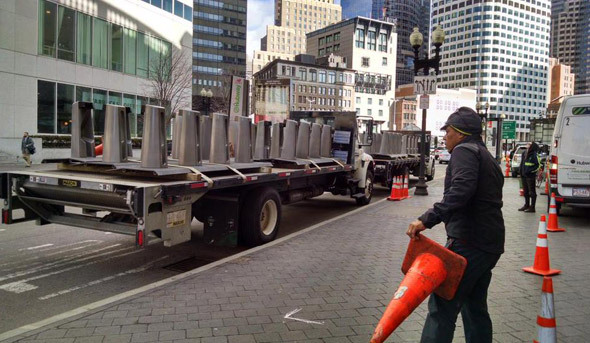 Claire Blechman watched workers reinstall the Hubway station outside South Station this morning. KWAPT shows us the non-moving bus traffic on Washington Street in Brighton, where a bus and a cab may have tried to occupy the same space at the same time. Traffic elsewhere is marginally better, except possibly in Kenmore Square, where the stop lights have taken the night off. 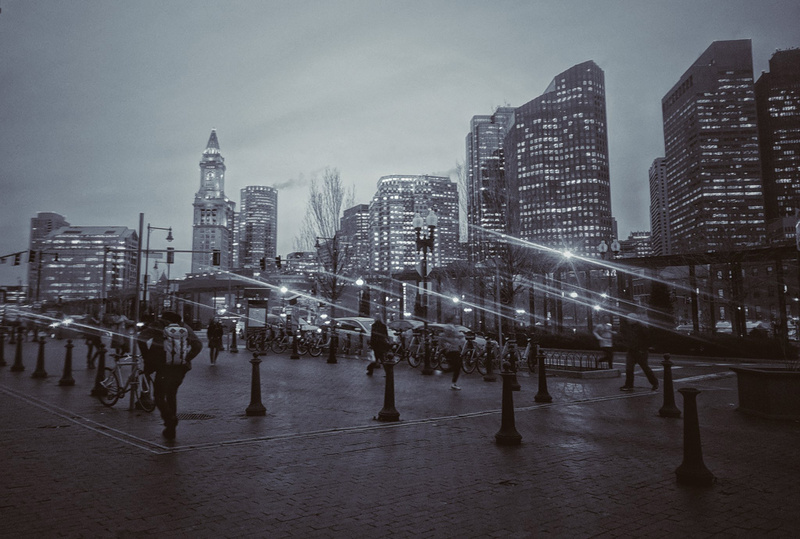 Jed Hresko captured a crew hooking up a generator to get the traffic lights around South Station working again after they went out right at rush hour. 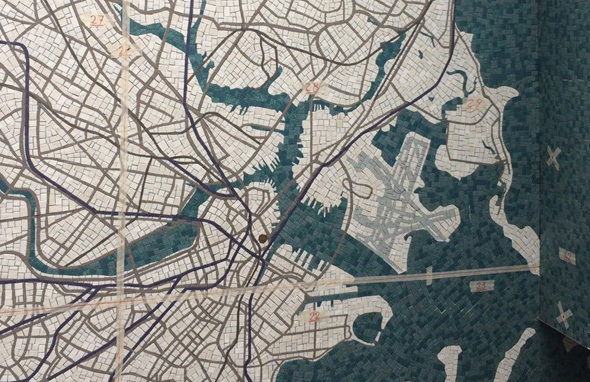 An unattended bag forced the shutdown of Atlantic Avenue along South Station between roughly 3:40 and 4:10 p.m. - when a bomb technician opened it up and found it filled mostly with papers. Another view by Mike McD. 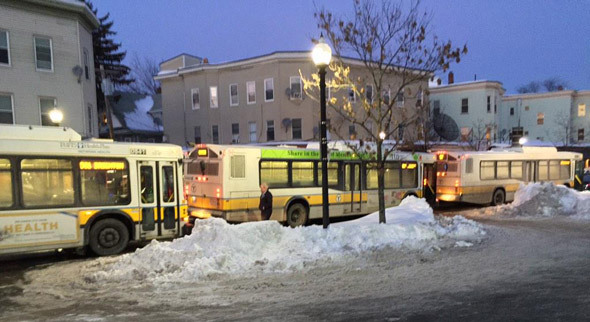 Ami Chitwood spotted the gobbler this morning, wonders if it was trying to hop on the 705 to Framingham. UPDATE, Monday morning: The Crimson reports the student died. The Crimson reports a Harvard sophomore is in critical condition at Mass. General tonight after he fell from a building early Sunday. The Crimson said Harvard and Cambridge police declined to say where he fell, except that it was not at Harvard or in Cambridge.